In many meat eaters’ minds, the word ‘vegetarian’ used to conjure up images of lettuce leaves and hunger, or bland platefuls of unsatisfying lentils and brown rice. When canvassing my male friends’ opinions on meat-free meals prior to my latest radio show, I was surprised to receive an open-minded, positive response: turns out it was me living in the past and taking a sexist stance on meaty meals, not them. Whether for economic or health reasons, more and more omnivores are choosing to forgo flesh on a regular basis, opting to base a higher number of their meals around vegetables. Even famous carnivore Hugh Fearnley-Whittingstall has recently experimented with eating an almost exclusively vegetarian diet with unexpectedly positive results: seasonal vegetables can be the stars of a dish rather than the supporting act. With all this in mind, I finally visited the Magic Café for lunch. A bit of an East Oxford institution, the Magic Café serves breakfast, lunch, tea and cakes to an eclectic crowd including plenty of families no doubt enticed by its laid-back atmosphere and low prices. Surprisingly in a city like Oxford, there are only two exclusively vegetarian eating establishments to choose from, the Magic Café and the Gardeners’ Arms, both feeding residents’ meat-free needs for years. With a full menu of vegetarian and vegan breakfasts from £2.50 and daily lunch offerings from £3, the Magic Café currently only caters to hunger pangs during daylight hours, although this looks set to change with their first evening opening on 7 October. Visiting on a weekday lunchtime, offerings included a mixed vegetable vegan soup (£3), a pie of the day (Russian koulbiaka, £3.50), a selection of salads and a chickpea and apricot tagine (£5.70). 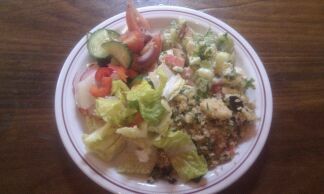 S opted for a full plate of salad (£4), heaped with waldorf, Greek, cous cous and leaf varieties. Fresh, lively and filling, it was much tastier than a soggy supermarket sandwich for only a few pence more. L’s koulbiaka met her high expectations: as a former resident of Russia, she was familiar with the traditional version of the dish, made with salmon rather than mozzarella. 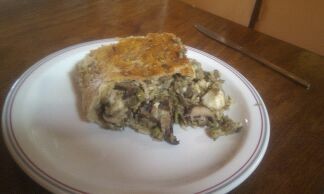 Also containing rice, egg, mushrooms and peas encased in pastry, it was a flavoursome and filling lunch. Served with herb-flecked cous cous, homemade houmous and pitta bread, my hearty tagine was a lovely autumnal dish: rich, packed with vegetables and with just a hint of apricot adding a subtle extra dimension of flavour. 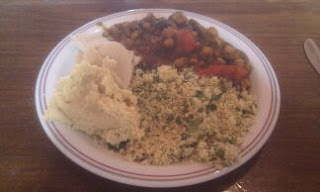 Combined with the extra accompaniments, it certainly kept me full for the rest of the day. With its boho interior and unfussy but delicious vegetarian food, the Magic Café is definitely one of the old guard of vegetarian restaurants. No flash fixtures, no wacky creations on their menu: just a tried and tested formula which keeps customers happy (and with its plentiful portions, full). And with evening openings hopefully set to become a regular occurrence, a new chapter in their history may be just about to begin. For more ideas on where to eat vegetarian food in Oxfordshire, you can listen to my appearance on Jo Thoenes's show on BBC Radio Oxford on 23 September here until 30 September. The Magic Café is at 110 Magdalen Road. To book for Dodo’s Vegetarian Restaurant at the Magic Café on Friday 7 October (vegan and vegetarian options available), call 01865 794604.